Cannabis Seed collectors are well and truly spoilt for choice when it comes to unique cannabis strains: But with so many seed-banks out there offering a virtually limitless number of high-quality strains, it can often prove to be very difficult to know where to start and, unless you have the resources of a mega-corporation at your disposal, impossible to collect them all: So what’s a seed-collector supposed to do? One very quick way to boost your seed library into a more formidable force is to add a few heavy-hitting cup-winners to your line-up…This will instantly make your collection the envy of all your peers and allow you to enjoy an even greater sense of pride when admiring your new additions. ‘Cup-winners’ are prized among the most discerning collectors as some of the most noteworthy specimens on the planet, having beaten off stiff competition and successfully wooing the judges of prestigious events like the High Times Cannabis Cup with their outstanding genetics, superb quality and unique properties. 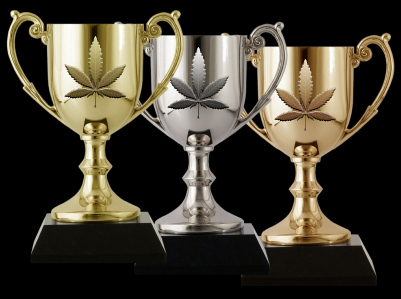 As an outright winner of one of the most-hotly contested competitions (the mostly-Indica class Cannabis Cup), Super Skunk blew away the judges with its impeccable Skunk-Afghani characteristics: The genetics locked within each seed of this impressive 80% Indica strain hold the key to creating supremely potent, robust and intensely fragrant results, with a remarkable amount of ease. This heavy-yielding Caribbean beauty was especially developed over the course of two years by the genetic-wizards at Sensi Seeds to celebrate the life and lasting legacy of Bob Marley: a task which was taken very seriously, given the legendary status of this most iconic and celebrated of artists. The resulting strain which emerged from Sensi’s research lab combined top-grade Jamaican genetics with a gorgeous Afghani cultivar to produce a 60/40 Sativa/Indica blend that was truly worthy of the Marley moniker. Marley’s Collie is prized among collectors for its superb genetics which have the potential to produce huge buds, massive amounts of resin and spectacular structures when in full bloom. Judges went positively gaga over the deliciously sweet, spicy flavour profile and rich aroma of this strain, which was also noteworthy for its remarkably warming, enlightening effects. As the second strain in our list to be named in honour of an important cultural icon, Jack Herer deserves its reputation as the crème-de-la-crème of cannabis cup winners: In fact, as the most awarded variety of cannabis seed to ever hit the festival scene, this is one legendary strain that no collection would be complete without! Jack Herer is a masterful blend of exotic, tropical Sativa genetics (55%), with a resinous, Indica twist (45%) – The results which judges were able to sample were simply mind-blowing: Thanks to its diverse heritage, this versatile strain displays enriched features from both sides of its family-tree, which include the potential to create sparkling, crystal laden coverage and fat, swollen buds. The effects which this strain is reported to possess include the ability to create a highly potent, cerebral high which is supercharged by a potent body-buzz. This blog post has been brought to you for information and entertainment purposes only: We urge all of our readers to strictly adhere to the laws of their country.